The 2007 Atlantic hurricane season will be far more active than usual with nine hurricanes, and the United States has an above-average chance of being hit by a major storm. The 2007 Atlantic hurricane season will be far more active than usual with nine hurricanes, and the United States has an above-average chance of being hit by a major storm, a closely watched forecasting team said on Tuesday. In an updated outlook, the Colorado State University forecasters led by pioneer researcher William Gray said the June. 1-November 30 season will produce 17 tropical storms. Of the nine hurricanes forecast, five will be major ones of Category 3 or higher with winds over 110 mph (177 kph). London-based forecaster Tropical Storm Risk also updated its forecast on Tuesday. It calls for 17 tropical storms and nine hurricanes. If the predictions prove true, 2007 could mark a return to the destructive seasons of 2004, when four strong hurricanes hit Florida, and 2005, the year of Katrina, after a mild 2006 when only 10 storms formed. The 2004 and 2005 seasons rattled oil and insurance markets as hurricanes rampaged through the oil and gas fields of the Gulf of Mexico. Hurricane Katrina was the costliest storm in U.S. history, causing more than $80 billion in damage in New Orleans and along the Gulf Coast. 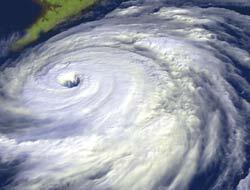 The 2005 season was a record-breaker with 28 storms and 15 hurricanes. All the leading forecasters, including Gray's group and TSR, erroneously predicted a busy season in 2006. The April 2006 forecast issued by Colorado State University was identical to the forecast for 17 storms and nine hurricanes this year. The CSU team, led by Gray and Philip Klotzbach, raised the number of expected storms and hurricanes from the 14 and seven, respectively, that it had predicted in December. The forecasters said the disappearance of the El Nino warm-water phenomenon in the eastern Pacific, which dampened Atlantic hurricane activity last year, and warm Atlantic sea surface temperatures lay behind their upgraded forecast. "We've seen El Nino conditions dissipate quite rapidly late this winter so we do not think that's going to be an inhibiting factor this year," Klotzbach said in a statement. "Also, we have warm Atlantic sea surface temperatures this year which we've seen just about every year since 1995."